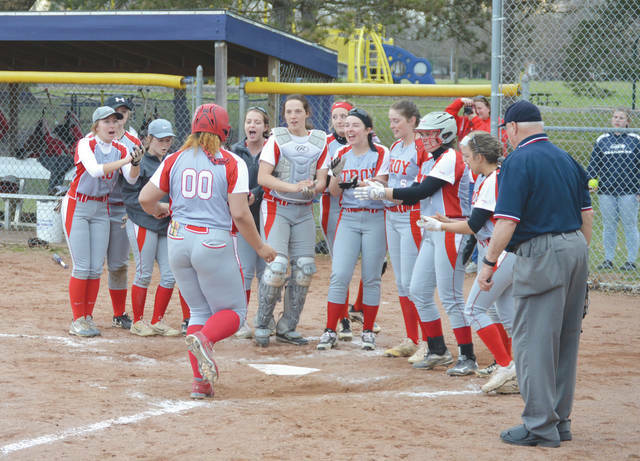 John Bombatch|AIM Media The entire Troy Trojans team waits to greet junior first baseman Tia Bass (00) after she hit a solo home run over the right field fence in the fourth inning of Friday’s win over host Fairborn. FAIRBORN — After a rough start to their season, the Troy Trojans softball team enjoyed a run-ruled road win Friday over the Fairborn Skyhawks at Community Park. Troy, now 2-9 overall and 1-2 in the Greater Western Ohio Conference’s American North, opened up the game with seven runs, added six more in between, then closed out the sixth with seven more runs to claim a 20-8 win in six innings. Unofficially, Troy smacked 13 hits and took advantage of eight walked Trojans, two Skyhawks errors and at least one hit batsman. Briana Lavender hit a triple and eventually scored in the second inning, Kaitlyn McClure smacked two doubles, and Tia Bass bashed a solo home run over the right field fence for Troy. The steady rotation of Trojans pitchers Erica Keenan, McClure and Paige Nadolny kept the Fairborn bats confused, and Troy’s defense played errorless softball in the win. Beeler congratulated Fairborn junior shortstop Kendall Winn on her defensive play, including a diving catch to rob Troy’s Ella Furlong of a hit in the second inning. Second baseman Madison Durbin made a head-first dive to stop a Jaiden Hunt grounder, then flipped on to senior first baseman Kelsie Coleman to throw out the speedy Trojan in the same inning. Coleman, Kenzie Culbertson and Ashlyn Baker recorded multiple hits for Fairborn. After the game, Fairborn coach Tim Duncan spoke briefly with his team, hopped on a small tractor and began grooming the infield in rapid circles. Still wearing a frown, the Skyhawks coach briefly stopped long enough to talk about the game. Troy travels to Sidney Monday. https://www.tdn-net.com/wp-content/uploads/sites/21/2019/04/web1_00HomeRun_PS.jpgJohn Bombatch|AIM Media The entire Troy Trojans team waits to greet junior first baseman Tia Bass (00) after she hit a solo home run over the right field fence in the fourth inning of Friday’s win over host Fairborn.